Halloween Freebie "Spooky Fruit Graph"
While cruising the Halloween section Saturday at Target in Chico-- I know what your are thinking, that girl really knows how to live it up!!! I came across these cute fruit snacks. I originally bought them to give to my kids on Halloween as a special snack. However after opening several packages- to make sure they didn't taste yucky, I decided to make a fun graphing game. Of course I had to open a few more packs just to see what shapes were in each of them. I could have avoided eating several (4) packages if I would have looked at the side of the box that showed the pictures. So, if you find yourself wandering the isles of Target between now and Thursday, grab a box and download my free graph. Thank you, I finally found the gummies! It felt like I won the lottery, LOL. 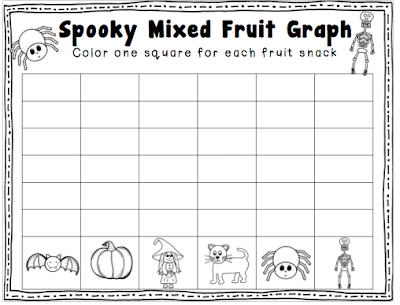 I found the spooky fruit snacks at my local target and was hoping to do this activity with my class. I can't seem to get the link to work. Thanks!